It’s been a nail-biting few weeks, but at 12.02pm on Monday June 15, the nerves turned to tears. These were not tears of shock, horror or grief, like the tears shed by so many of us on election night — they were tears of joy and relief. If you haven’t figured out by now what I’m talking about, you are not a Corbynite, Corbynista, Jezzite, or any one of the numerous nicknames for a Jeremy Corbyn supporter that have been tested out on social media over the past few days. Some people will undoubtedly marvel at this outpouring of emotion — he has yet to win the actual leadership. But they wouldn’t marvel if they’d travelled the entire journey with us, from losing an election we hoped to win to having a leader most of us respected and admired step down, to waiting to see who would throw their hats in the leadership ring and having those same contenders deeply disappoint. We started petitions urging an anti-austerity candidate to stand, but lost hope it would ever happen. Then we were told Corbyn had put himself forward, only to realising how scant his support among the parliamentary Labour Party was. We began writing to, emailing and tweeting every potential nominee at least five times a day to ask for their support, taking part in spontaneous Twitter showers and organised Twitter storms. 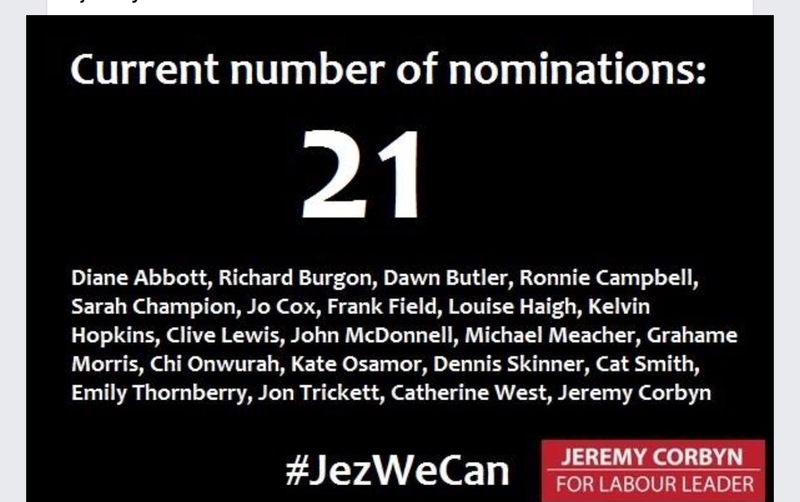 Nominations crept up, yet we watched news presenters dismiss the idea that Corbyn could ever possibly cross the line. In those final few hours, where nominations were coming in dribs and drabs, his supporters all over the country were perched on the edge of their seats. With five minutes to go, Jeremy was still three nominations short. Then came that magical moment where we read the first tweet or FB announcement: “He’s done it!” and still found ourselves asking, “Are you sure?” too scared to believe it could possibly be true. Yes it’s been quite a breathless journey, but that was just the start. The morning after his victory I woke up slightly fuzzy headed after a celebratory bottle of Prosecco and checked my Twitter feed. Someone had directed me to an article by Blairite journalist Dan Hodges. The headline was: “Jeremy Corbyn proves the lunatic wing of the Labour Party is still calling the shots.” And so it begins, I thought wryly. Was I disheartened by this headline? Quite the contrary. It was what I had expected. Jeremy has shaken things up. His entry into the race could be humoured to some extent, but to have him on the ballot, which means he might actually become Labour leader — now that’s a different thing entirely. And people like Dan Hodges, with a Dan Hodges perspective, are right to be scared. A momentum is gathering. A momentum started by Ed Miliband, who was also held in disdain by Hodges. When Miliband started a discussion on inequality, he ignited hope in the hearts of the membership. Pre-Ed, Labour members may have been relatively content with the candidates on offer. 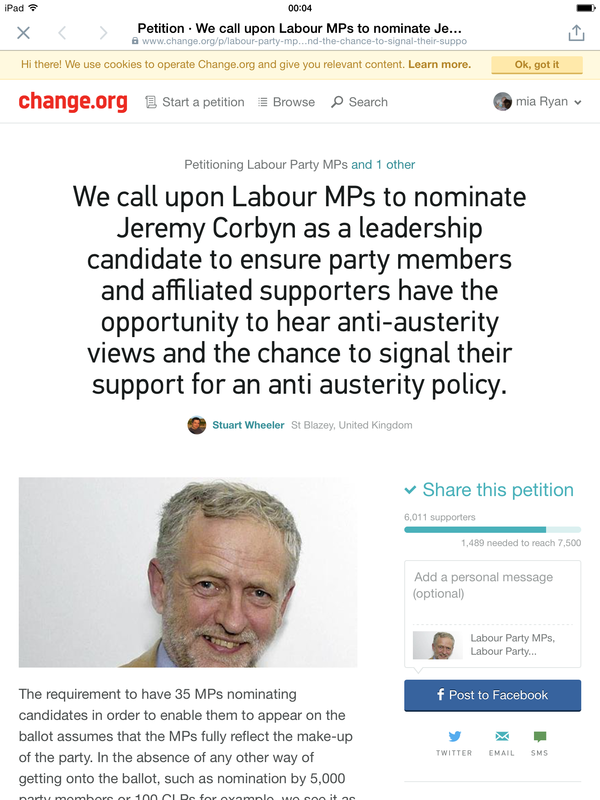 We may never have started a petition calling for an anti-austerity candidate to stand. Corbyn may never have stepped forward, and the ensuing campaign to get him on the ballot would never have taken place. Ed was the catalyst. He set the wheels in motion, and we, the ordinary members, were not prepared to let anyone slam on the brakes. Now we have a candidate who takes Miliband’s message on inequality even further. He is a candidate thousands of members — members who see through the lie of austerity — can rally round. He doesn’t squirm awkwardly in interviews like the other candidates for fear of saying something that sounds too socialist. This makes him a breath of fresh air. In every poll I’ve seen, where people are asked to select their choice for leader, from Labour List to the Labour Party Facebook forum, Jeremy is streaks ahead. This does nothing to reassure people like Hodges — people who believe the only way to win elections is to appease Murdoch. They saw how Ed was treated by the press and anticipate someone like Corbyn being savaged even more. And they are right. Corbyn will be savaged. But he has a powerful antidote at his disposal — the power to inspire and to speak over the heads of the press. In 2015 our message on reducing inequality became muddied with talk of austerity and curbing immigration. In 2020, under Corbyn, we would be putting forward a clear, unapologetic offer of socialism. 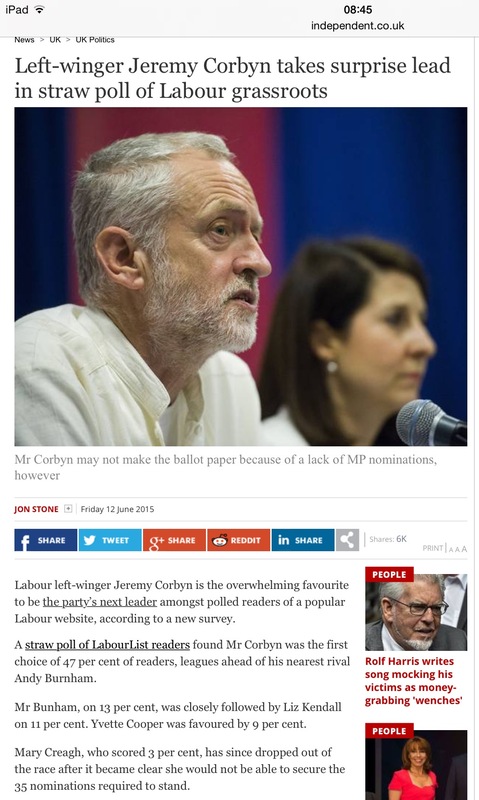 In 2015, 35 per cent of the electorate were not sufficiently inspired by Labour to vote. 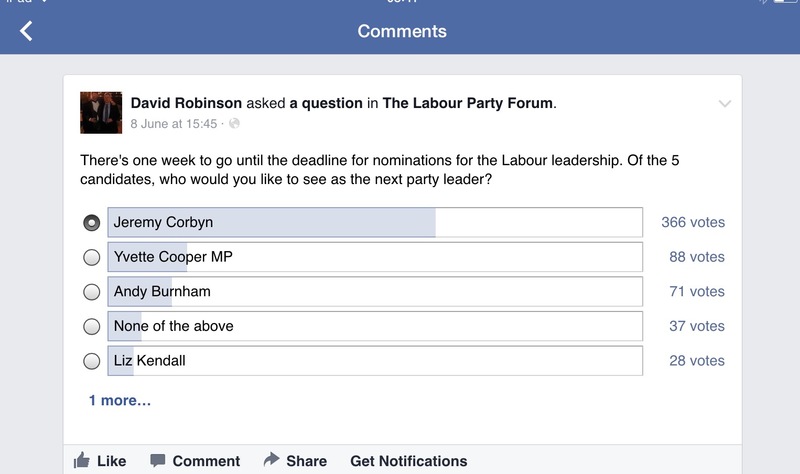 In 2020, if Corbyn is leader, they will vote Labour in their droves. The Scottish referendum proved something invaluable. When real change is on offer, people vote.